Trump's off-the-record remarks to Bloomberg were obtained by a Toronto newspaper. 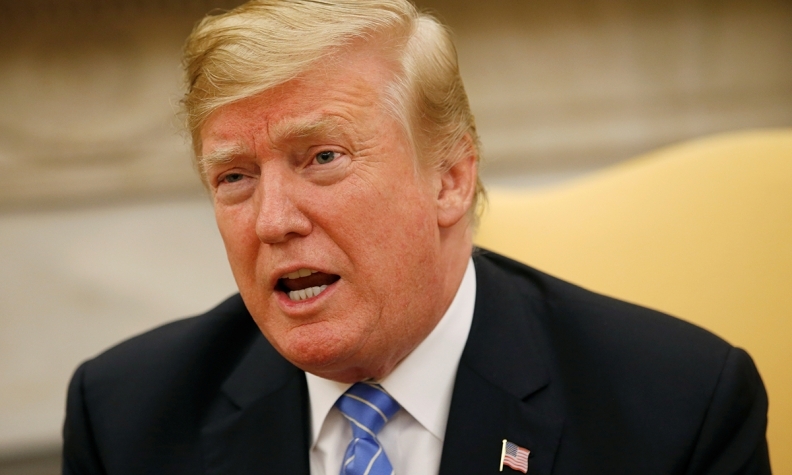 WASHINGTON -- U.S. President Donald Trump turned to Twitter on Friday afternoon to confirm what he said in off-the-record remarks to Bloomberg News this week that any trade deal with Canada would be "totally on our terms." The Toronto Star first reported the comments on Friday, citing remarks it had obtained. Asked about the report, White House spokeswoman Lindsay Walters said: "The Canadian and American negotiators continue to work on reaching a win-win deal that benefits both countries." Meanwhile, NAFTA negotiators from the U.S. and Canada are "not there yet," in resolving differences keeping them from a deal to modernize the agreement, Canadian Foreign Minister Chrystia Freeland said. Freeland emerged from the morning's talks just minutes after news of Trump's remarks rippled through the media corps gathered outside the offices of the U.S. trade representative, where the negotiations have been taking place all week. "We're not there yet," she cautioned. "Ambassador (Robert) Lighthizer and his team, throughout this negotiation, have been working really, really hard," she said. "Bob and I joke sometimes that we could switch chairs we know each other's positions so well. And we're working hard to find that win-win space." Speaking to reporters Friday in Oshawa, Ont., Prime Minister Justin Trudeau was asked about the reports on Trump's off-the-record comments. Trudeau said that "over the past year and a half there's a lot of things that have been said from time to time." "I think people have noticed that our government's approach is always to stay constructive, positive, to engage on the substance of issues and to demonstrate that we understand that the path forward is one of making sure that there's win-win-win on all sides," Trudeau said. "We're going to remain constructive, positive, serious and creative about what we do around the negotiating table? We are also going to be unequivocal about always standing up for Canadians' rights and Canadians' interests." Earlier in the day, both Canadian and American negotiators were showing few signs of budging on their most stubborn NAFTA positions as the day of Trump's Friday deadline began. A statement from the U.S. trade representative's office said Canada had made no compromises to the American side on the thorny issue of dairy-market access: "there have been no concessions by Canada on agriculture," it read. This week's new round of U.S.-Canada negotiations had generated hopeful signals from both camps that a deal could be struck by the end of the week — but difficult discussions about dairy and dispute settlement remain, and were holding back progress on Friday morning.